We always have perceptions about various things in life. Mediclaim is one of them. We live with certain Myths about your Health Insurance without bothering to know the facts. We often think that buying a health insurance policy by reading the fine print and then going by what we know is what makes us fully aware about the policy details. Well, mostly it is true, however human mind is perceptive and certain things stick to it resulting in Myths. Health Insurance is no different. 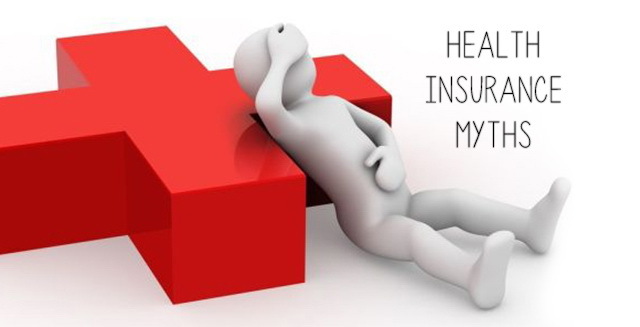 We have Myths about Health Insurance in our heads that we are not consciously aware of. We believe certain things happen a certain way and certain things are not covered and certain things should be and so on. We also at times are mystified by the various inclusions and exclusions of a policy. So what are the common myths about Mediclaim or Myths about health insurance in India? We often fret and compare the pre-existing disease part of a mediclaim policy. However, the thing is that every health insurance comes with a pre-existing disease clause which once over, will cover your disease as mentioned in the policy. Also, if you are perfectly healthy at the time of taking your Health Insurance policy, then the pre-existing clause DOES NOT APPLY to you. A common health insurance myth in India is that cashless is the answer to all your medical worries. However it does not work that way always. Firstly the hospital you are admitted to should be a willing partner in the cashless program of your mediclaim provider, so if the hospital has this arrangement, surely you will be admitted cashless, but not otherwise. Secondly the claim desk at your hospital may not be operational 24×7 like the other hospital staff, so if you are being hospitalized at the time when the insurance desk in your hospital is closed, you may have to pay upfront till the staff returns the next day. Also if you are admitted to a non-network hospital, then your cashless doesn’t work there as well. This Mediclaim Myth in India has arisen due to the fact that till a couple of years back most health insurance providers were not willing to cover pregnancy, since they viewed it as a sure-shot claim in most cases. This has however changed and insurers have now started to cover pregnancy in the health insurance cover as well. However, there certain conditions and depending on your policy you may find that some policy require a waiting period of 3 years before they cover pregnancy related claims, while some would only cover the 1st pregnancy. Whatever the case is, pregnancies are now covered albeit conditionally, so when you do opt for a mediclaim in India, check out the pregnancy clause and its conditions. A very common myth about health insurance in India is the need to be hospitalized for 24 hours in order to make a claim. This is a myth since not all procedure would require 24 hour hospitalization. Procedures like Cataract, Dental treatments (if covered in your policy) then such procedures are Day-Care and do not warrant a 24 hours hospitalization. Go through the list of Day-care procedures covered in your policy before you assume that if and only if you are admitted for 24 hours, then can your claim pass. 24 hours hospitalization is required only where ‘necessary’ as mentioned in the policy. As mentioned in the first point, pre-existing disease clause is only applicable to you if you have any disease at the time of taking the policy. So the fact that you are comparing the pre-existing disease clause in various polices before buying then, it is a waste of time and energy. Also in case you do have a pre-existing disease, then most policies will cover any hospitalization arising out of it after 2 policy years, which is pretty much the same for most policies. Yet another myth about mediclaim is that the more exhaustive a list of covered day care procedures, the better is. For instance if you happen to see a policy covering say 30 day-care procedures compared to a policy covering 100 procedures, I am sure most of you would go for the 100 one. WRONG. Actually the thing is the more the exhaustive a list, the more chances of rejection of claim since everything is mentioned to the T. Let me explain, say Policy A states in the list of covered day-care procedures that it covers Eye Surgeries and Policy B states that it covers 8 different types of eye surgeries. Now Policy A is better since it covers Eye Surgeries as a generic procedure, whereas B covers specific surgeries, so if your eye surgery doesn’t fall under the 8 mentioned procedures… NO CLAIM, while A will honour your claim since it is a generic term. Make sure you understand this before comparing and opting for polices. Room capping is simply put equivalent to the amount of premium you pay. If a person is paying 2000 INR for 1 Lac cover in a year he has a certain Room Rent limit while a person paying 6000 INR for 4 Lac cover gets more. It is actually not a big deal. Some Health Insurance have not capping but even if they do, it not a reason to reject the policy, since is based on you get what you pay principle. The biggest myth about Mediclaim is the perception that since a policy is bought through a known agent, it is good and means peace of mind. It is not so. The agent may change job, may not be available when you make a claim anything can happen. More over the companies go by the terms and conditions mentioned in their policy document and not by the fact that you bought it from a known agent. Things can go wrong even when you buy health insurance from a known agent if you have been careless regarding the terms and conditions of the policy or the agent misled you. Mediclaim is a contract that is renewed every year between the insurer and the insured. Like every contract the terms can change at the time of renewal. You better be sure to keep checking any update emails or letter you may have received from your insurer at the time of making the premium payments to avoid any surprises later on. This Health Insurance Myth better be busted. Just like the above, even network hospitals can change from year to year. The insurance company can add or remove any hospital in the list. If network hospital is your primary motive behind the policy then you may be disappointed. As long as there are good hospitals in your vicinity included in the network list, you should be fine. This is 2014. Things are going to go online even more now. Buying insurance form a person will have the same terms and conditions as buying it online as long as the policy is the same. If anything the premium may be lower for online policy since the agent is not involved and so his commission is not payable by the company. This benefit is passed onto you. It is perfectly fine to buy online policy as long as you will read the policy document carefully and you can always contact their customer care for clarifications. We have this perception in India that any form of Insurance is primarily for tax-benefit and then for the coverage purpose. If you have bought your health insurance for tax saving purposes and not bothered to review the policy details, you will be in for a lot of surprises when you do need to make a claim. Better buy insurance for its main purpose and that is to Insure.